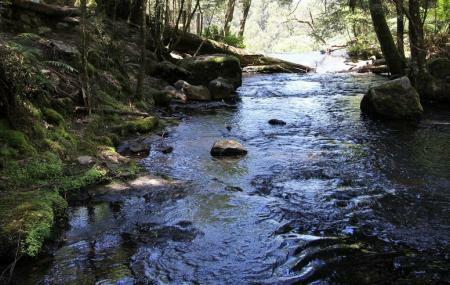 Find hotel near Russell River National Pa .. It is a small coastal park, located in the Wet Tropics World Heritage Area, nearly 65 kilometer away from of Cairns. Unlike other national parks, this park is exclusive best location for camping. The striking feature of the park is the mangrove forests surrounding the park. However, be aware of the crocodiles that you may encounter in the area. 1 family in camping means 2 adults and 3-6 children. Always bury human waste at least 15 cm deep and well away from camps, tracks and watercourses. Open fires are allowed. However, fire woods are not provided and must not be collected from the park. Things to bring are: drinking water, rubbish bags, insect repellent, firewood or preferable a fuel stove and trowel or shovel. $3.20 per person per night for students and accompanying adults on approved excursions. How popular is Russell River National Park? People normally club together Babinda Boulders and Mamu Rainforest Canopy Walkway while planning their visit to Russell River National Park. Pretty little place, damn shame people won't clean up after themselves however. No facilities but wonderful beach and fishing. Get there early camp areas go quick. Bring everything no shop no toilet or shower. Always good. Ask a local to take you.